What better way to celebrate halloween than with a Christmas kit, right? LOL! That seems to be the norm around here as a lot of stores are already playing Christmas music. I like it as much as the next guy, but I've got to tell ya, even I have to wait til after halloween. So isn't it ironic that I've spent the week working on a Christmas kit? LOL! I love this kit so much that I couldn't wait to give you a little peek. I'll have LOTS to blog about tomorrow with it being Digital Scrapbook Day, so I thought I'd get the party started early with a peek. This will be available in the shoppe tomorrow (11/1/08), so I'll be back with a link then. Be sure and check back tomorrow. I'll have more goodies and maybe even some prizes to celebrate DSD! This kit looks so fabulous!!! 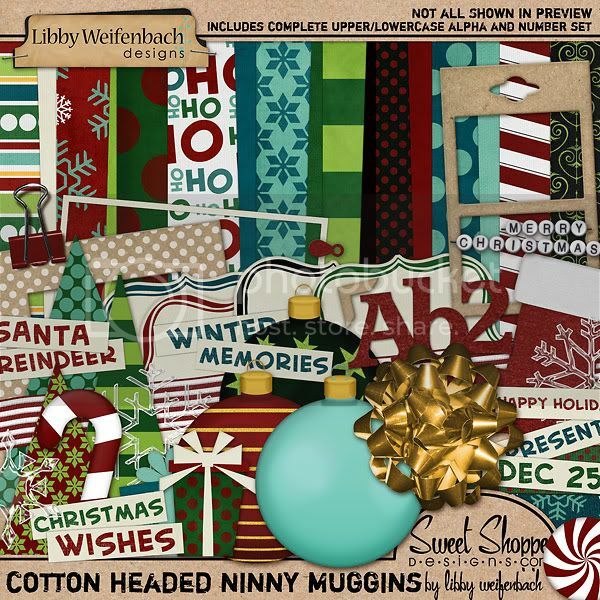 oh this is so beautiful Libby! love the colors you used!